The First Annual Turkey Drive was a huge success!! Thousands in donations were collected with the help of our wonderful community. In a great effort 4000 lbs of turkey, 2500 lbs of canned goods and non perishable goods were collected. Also, over $1,000 in cash and checks for the Salt Mine were donated. Even local teens had a hand in donating. The Frozen Turkey and/or Canned Goods were collected at the Safeway in Lincoln and at Firehouse #34 on Joiner Parkway. A lot of people worked very hard to make this happen, they even had a drive through drop off! Thank you to our outstanding team of fire fighters, Lincoln CERT, Lincoln Rotary, Angeion Consulting, and of course all the community of Lincoln who went above and beyond to help their neighbors. Thank you to the Salt Mine who will be doing the hard work of making sure that all of your generous donations go to those in need. The Shrum boys also had a part in helping their hometown. The Lincoln community and surrounding areas participated in buying pumpkins to make their donation of Turkeys a success. 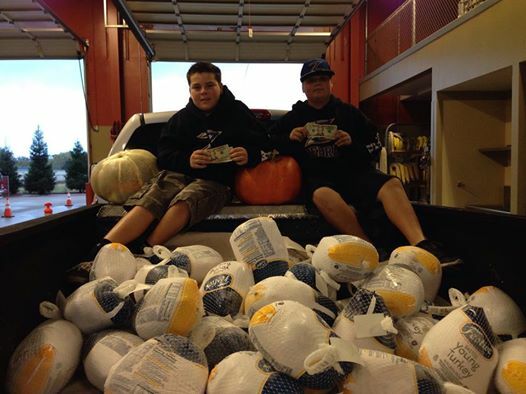 The boys took money from their pumpkin sales and was able to purchase 45 turkeys and donated them to the 1st Annual Turkey Drive at the Lincoln Fire Department. Thank you boys for your caring hearts and hard work!! We are so pleased this event was such a huge success and we look forward to partnering with everyone next year!! Have a Happy Thanksgiving and Happy Holiday.